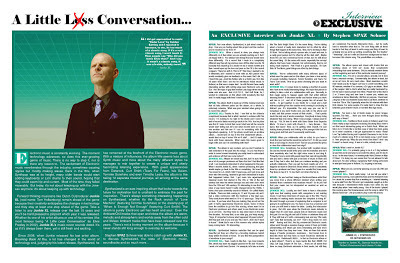 Discussions Magazine Music Blog: An EXCLUSIVE interview with JUNKIE XL! 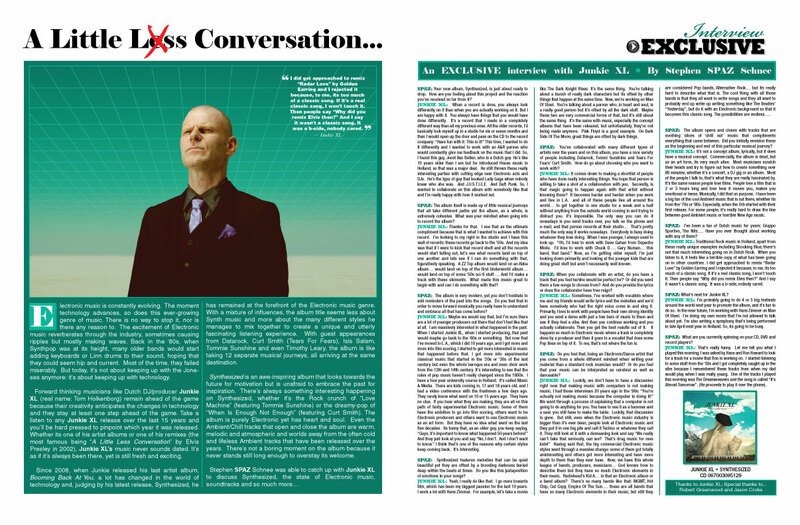 An EXCLUSIVE interview with JUNKIE XL! Electronic music is constantly evolving. The moment technology advances, so does this ever-growing genre of music. There is no way to stop it, nor is there any reason to. The excitement of Electronic music reverberates through the industry, sometimes causing ripples but mostly making waves. Back in the ‘80s, when Synthpop was at its height, many older bands would start adding keyboards or Linn drums to their sound, hoping that they could seem hip and current. Most of the time, they failed miserably. But today, it’s not about keeping up with the Joneses anymore: it’s about keeping up with technology. Forward thinking musicians like Dutch DJ/producer Junkie XL (real name: Tom Holkenborg) remain ahead of the game because their creativity anticipates the changes in technology and they stay at least one step ahead of the game. Take a listen to any Junkie XL release over the last 15 years and you’ll be hard pressed to pinpoint which year it was released. Whether its one of his artist albums or one of his remixes (the most famous being “A Little Less Conversation” by Elvis Presley in 2002), Junkie XL’s music never sounds dated. It’s as if it’s always been there, yet is still fresh and exciting. 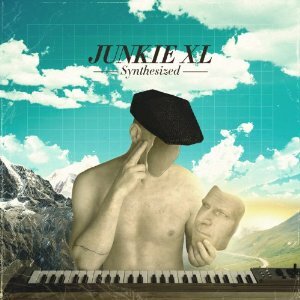 Since 2008, when Junkie released his last artist album, Booming Back At You, a lot has changed in the world of technology and, judging by his latest release, Synthesized, he has remained at the forefront of the Electronic music genre. With a mixture of influences, the album title seems less about Synth music and more about the many different styles he manages to mix together to create a unique and utterly fascinating listening experience. With guest appearances from Datarock, Curt Smith (Tears For Fears), Isis Salam, Tommie Sunshine and even Timothy Leary, the album is like taking 12 separate musical journeys, all arriving at the same destination. Synthesized is an awe-inspiring album that looks towards the future for motivation but is unafraid to embrace the past for inspiration. There’s always something interesting happening on Synthesized, whether it’s the Rock crunch of “Love Machine” (featuring Tommie Sunshine) or the dreamy-pop of “When Is Enough Not Enough” (featuring Curt Smith). The album is purely Electronic yet has heart and soul. Even the Ambient/Chill tracks that open and close the album are warm, melodic and atmospheric and worlds away from the often cold and lifeless Ambient tracks that have been released over the years. There’s not a boring moment on the album because it never stands still long enough to overstay its welcome. SPAZ: Your new album, Synthesized, is just about ready to drop. How are you feeling about this project and the reaction you’ve received so far from it? JUNKIE XL: When a record is done, you always look differently on it than when you are actually working on it. But I am happy with it. You always have things that you would have done differently. It’s a record that I made in a completely different way than all my previous ones. All the older records, I’d basically lock myself up in a studio for six or seven months and then I would open up the door and pass on the CD to the record company: “Have fun with it. This is it!” This time, I wanted to do It differently and I wanted to work with an A&R person who would constantly give me feedback on the music that I did. So, I found this guy, Joost Van Bellen, who is a Dutch guy. He’s like 10 years older than I am but he introduced House music in Holland, so that was a major deal. He still throws these really interesting parties with cutting edge new Electronic acts and DJs. He’s the type of guy that booked Lady Gaga when nobody knew who she was. And J.U.S.T.I.C.E. And Daft Punk. So, I wanted to collaborate on this album with somebody like that and I’m really happy with how it worked out. SPAZ: The album itself is made up of little musical journeys that all take different paths yet the album, as a whole, is extremely cohesive. What was your mindset when going into to record the album? JUNKIE XL: Thanks for that. I see that as the ultimate compliment because that is what I wanted to achieve with this record. I’m looking to my right in the studio and I have this wall of records: these records go back to the ‘50s. And my idea was that if I were to kick that record shelf and all the records would start falling out, let’s see what records land on top of one another and lets see if I can do something with that, figuratively speaking. A ZZ Top album would land on an Abba album… would land on top of the first Underworld album… would land on top of some ‘50s sci-fi stuff…. And I’d make a track with these elements. What made this music great to begin with and can I do something with that? SPAZ: The album is very modern, yet you don’t hesitate to add reminders of the past into the songs. Do you feel that in order to move forward musically you really have to understand and embrace all that has come before? JUNKIE XL: Maybe we would say that, but I’m sure there are a lot of younger producers out there that don’t feel like that at all. I am massively interested in what happened in the past. When I started Junkie XL, when I started producing, that past would maybe go back to the ‘60s or something. But now that I’ve moved to L.A., which I did 10 years ago, and I got more and more into film scoring, I started to get more interested in music that happened before that. I got more into experimental classical music that started in the ‘20s or ‘30s of the last century but even the whole baroque era and even choir work from the 13th and 14th century. It’s interesting to see that the rules of pop music haven’t really changed since the 1800s. I have a four year university course in Holland. It’s called Music & Media. There are kids coming in, 17 and 18 years old, and I had a video conference with the freshmen a few days ago. They rarely know what went on 10 or 15 years ago. They have no clue. If you hear what they are making, they are all on this path of fairly experimental Electronic music. Some of them have the ambition to go into film scoring, others want to be Electronic producers and others want to use Electronic music as an art form. But they have no idea what went on the last five decades. Its funny that, as an older guy, you keep saying, “Guys, it’s important to know what happened 50 years before!” And they just look at you and say “No, I don’t. And I don’t want to know.” I think that’s one of the reasons why certain styles keep coming back. It’s interesting. SPAZ: Synthesized features melodies that can be quiet beautiful yet they are offset by a brooding darkness buried deep within the beats at times. Do you like this juxtaposition of emotions in your songs? JUNKIE XL: Yeah, I really do like that. I go more towards film, which has been my biggest passion for the last 10 years. I work a lot with Hans Zimmer. For example, let’s take a movie like The Dark Knight Rises. It’s the same thing. You’re talking about a bunch of really dark characters but its offset by other things that happen at the same time. Now, we’re working on Man Of Steel. You’re talking about a person who, in heart and soul, is a really good person but it’s offset by all the dark stuff. Maybe those two are very commercial forms of that, but it’s still about the same thing. It’s the same with music, especially the concept albums that have been released, but unfortunately, they’re not being made anymore. Pink Floyd is a good example. On Dark Side Of The Moon, great things are offset by dark things. SPAZ: You’ve collaborated with many different types of artists over the years and on this album, you have a nice variety of people including Datarock, Tommi Sunshine and Tears For Fears’ Curt Smith. How do go about choosing who you want to work with? JUNKIE XL: It comes down to making a shortlist of people who have done really interesting things. You hope that person is willing to take a shot at a collaboration with you. Secondly, is that magic going to happen again with that artist without knowing them? It becomes harder and harder when you work and live in L.A. and all of these people live all around the world… to get together in one studio for a week and a half without anything from the outside world coming in and trying to distract you. It’s impossible. The only way you can do it nowadays is you send tracks over, you talk on the phone and e-mail, and that person records at their studio… That’s pretty much the only way it works nowadays. Everybody is busy doing whatever they love doing. When I was younger, I always used to look up. “Oh, I’d love to work with Dave Gahan from Depeche Mode. I’d love to work with Chuck D…. Gary Numan… this band, that band.” Now, as I’m getting older myself, I’m just looking down primarily and looking at the younger kids that are doing great stuff but aren’t necessarily well known. SPAZ: When you collaborate with an artist, do you have a track that you feel he/she would be perfect for? Or did you send them a few songs to choose from? And do you provide the lyrics or does the collaborator have free reign? JUNKIE XL: Sometimes, I’ve worked with vocalists where me and my friends would write lyrics and the melodies and we’d have somebody who had the right voice come in and sing it. Primarily, I love to work with people have their own strong identity and you send a demo with just a few bars of music to them and see if they feel a vibe. And then you continue working and you actually collaborate. Then you get the best results out of it. It happens so much in Electronic music where a track is completely done by a producer and then it goes to a vocalist that does some Pop lines on top of it. To me, that’s not where the fun is. SPAZ: Do you feel that, being an Electronic/Dance artist that you come from a whole different mindset when writing your material than a standard rock musician would? Or do you feel that your music can be interpreted as cerebral as well as danceable? JUNKIE XL: Luckily, we don’t have to have a discussion right now that making music with computers is not making music. I had those interviews 20 years ago in the ‘90s: “You’re actually not making music because the computer is doing it!” We went through a process of explaining that a computer is not going to do anything for you. You have to see it as a hammer and a saw: you still have to make the table. Luckily, that discussion is gone. But still, even when the Electronic music industry is bigger than it’s ever been, people look at Electronic music and they put it in one big pile and call it Techno or whatever they call it. They still look at it with a demeaning look and say “We really can’t take that seriously, can we? That’s drug music for rave kids!” Having said that, the big commercial Electronic music styles went through a massive change: some of them got totally uninteresting and others got more interesting and have more depth to them than they ever have. Now, we have this whole league of bands, producers, musicians… God knows how to describe them but they have so much Electronic elements in their music. Radiohead’s Kid A… is that an Electronic album or a band album? There’s so many bands like that: MGMT, Hot Chip, Cut Copy, Empire Of The Sun…. these are all bands that have so many Electronic elements in their music, but still they are considered Pop bands, Alternative Rock… but its really hard to describe what that is. The cool thing with all those bands is that they all want to write songs and they all want to probably end up write up writing something like The Beatles’ “Yesterday”, but do it with an Electronic background so that it becomes this classic song. The possibilities are endless…. SPAZ: The album opens and closes with tracks that are soothing slices of ‘chill out’ music that compliments everything that came between. Did you initially envision these as the beginning and end of this particular musical journey? JUNKIE XL: It’s not a concept album, lyrically, but it does have a musical concept. Commercially, the album is dead, but as an art form, its very much alive. Most musicians scratch their heads and try to figure out how to create something over 80 minutes, whether it’s a concert, a DJ gig or an album. Most of the people I talk to, that’s what they are really fascinated by. It’s the same reason people love films. People love a film that is 2 or 3 hours long and love how it moves you, makes you emotional or tense. Musically, I did that on purpose. I have been a big fan of the cool Ambient music that is out there, whether its from the ‘70s or ‘80s. Especially, when the Orb started with their first release. For some people, it’s really hard to draw the line between good Ambient music or horrible New Age music. SPAZ: I’ve been a fan of Dutch music for years: Gruppo Sportivo, The Nits…. Have you ever thought about working with any of them? JUNKIE XL: Traditional Rock music in Holland, apart from these really unique examples including Shocking Blue, there’s not that much interesting going on in Dutch Rock. When you listen to it, it feels like a terrible copy of what has been going on in other countries. I did get approached to remix “Radar Love” by Golden Earring and I rejected it because, to me, its too much of a classic song. If it’s a real classic song, I won’t touch it. Then people say “Why did you remix Elvis then?” And I say it wasn’t a classic song. It was a b-side, nobody cared. SPAZ: What’s next for Junkie XL? JUNKIE XL: I’m probably going to do 4 or 5 big festivals around the world next year to promote the album, and it’s fun to do so. In the near future, I’m working with Hans Zimmer on Man Of Steel. I’m doing my own movie that I’m not allowed to talk about yet. I’m also writing a symphony that’s being performed in late April next year in Holland. So, its going to be busy. JUNKIE XL: That’s really funny. Let me tell you what I played this morning. I was asked by Hans and Ron Howard to look for a track for a movie that Ron is working on. I started listening to some stuff from the ‘50s and I got completely caught up in the vibe because I remembered these tracks from when my dad would play when I was really young. One of the tracks I played this morning was The Dreamweavers and the song is called “It’s Almost Tomorrow”. (He proceeds to play it over the phone).